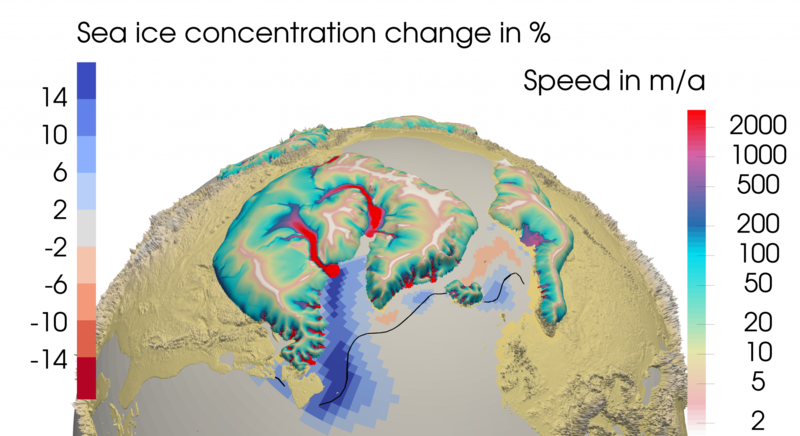 Ice velocities and sea-ice concentration change during the ice sheet surge. Over the ocean, colors mark the sea ice concentration change compared to the time before the surge. The black isoline marks 15 % sea ice concentration before the surge. Vertical exaggeration: 100. Surface topography is displayed around the ice sheets for orientation. A team of researchers around Dr. Florian Ziemen in the department "The Ocean in the Earth System" at the Max Planck Institute for Meteorology (MPI-M) found that Heinrich events, climate changes during the last ice age, were caused by a succession of the effects of two mechanisms: iceberg calving, having effects on the ocean, and ice sheet elevation loss, having effects on the atmosphere. Using a novel model setup, they were able to study the relationship between the two individual effects. They were the first to observe the succession of both effects in one simulation. The melting of the ice in the ocean released freshwater that has a lower density than ocean water. The less dense water formed a fresh lid on the ocean and thus weakened the sinking of dense water masses in the North that drives the meridional overturning circulation. This weakening reduced the northward heat transport in the Atlantic and thus led to cooling in Europe. The sliding of the ice into the ocean also lowered the surface of the ice sheet. The lower surface allowed the winds to pass further and further northward and thus prolong the cooling in Europe. This study became possible through the development of a fully coupled ice sheet - climate model. These models are very new and rarely used for such long simulations. Traditionally, studies of the effect of freshwater on the ocean use models without ice sheets, and neglect the ice sheet elevation changes. A previous coupled study (Roberts et al., 2014) that showed the importance of the elevation changes suppressed a major part of the ocean response to the ice discharge by not giving the ocean enough time to respond. Here, for the first time, both the effects on the atmosphere and on the ocean were represented adequately in one simulation, allowing the study of the sequence of the climatic effects. Ziemen, F., Kapsch, M.-L., Klockmann, M., & Mikolajewicz, U. (2019). Heinrich events show two-stage climate response in transient glacial simulations. Climate of the Past, 15, 153-168. doi:10.5194/cp-15-153-2019. Roberts, W. H., Valdes, P. J., and Payne, A. J. (2014). Topography's crucial role in Heinrich Events, Proc Natl Acad Sci U S A, 111, 16688-16693, doi:10.1073/pnas.1414882111.